This page is for the remaster. 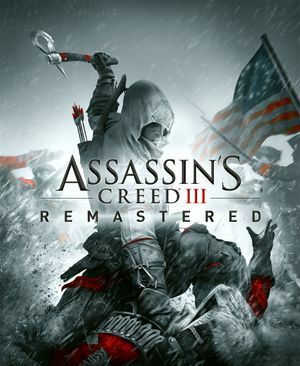 For the original releases, see Assassin's Creed III and Assassin's Creed: Liberation HD. Remastered version of Assassin's Creed III and Assassin's Creed: Liberation featuring new character models, a new Physically Based Render (PBR) light system, higher resolution textures, and HDR support (for AC3 only). Free for all owners of Assassin's Creed Odyssey Season Pass. Game does not launch on a hard drive designated as a Storage Space by Windows. See Issues fixed. Controlled by Texture Quality setting. Not available in Assassin's Creed Liberation Remastered. Enabled by default. No option to disable. The game's vegetation seems to be lacking ambient occlusion. If you received the game on Steam alongside the Odyssey Season Pass, the game may ask for a CD Key upon first launch which is not provided to you. Full minimum and recommended specs based on target resolution and frame rate can be found here. ↑ 1.0 1.1 File/folder structure within this directory reflects the path(s) listed for Windows and/or Steam game data (use Wine regedit to access Windows registry paths). Games with Steam Cloud support may store data in ~/.steam/steam/userdata/<user-id>/911400/ in addition to or instead of this directory. The app ID (911400) may differ in some cases. Treat backslashes as forward slashes. See the glossary page for details.